I'm Here. I'm Queer. What the Hell do I read? 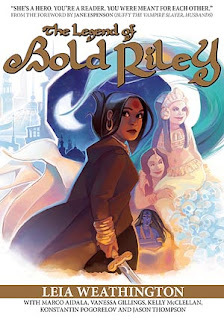 : The Legend of Bold Riley - A Graphic Novel with Swords, Sorcery, and a Female Hero who Always Gets The Girl! The Legend of Bold Riley - A Graphic Novel with Swords, Sorcery, and a Female Hero who Always Gets The Girl! Princess Rilavashana SanParite, called Bold Riley, has hunted the wildest game and dallied with countless beautiful girls, but still longs to know the world beyond the city walls. So she leaves behind her station and sets out to travel through distant lands and find forgotten ruins, fearsome enemies, inscrutable gods and tragic love. Bold Riley is as capable with a sword as she is with her wits—man, does she carve things up when the need arises—and is a strong, beautiful, confident woman who doesn’t wear a bikini into battle. And she always gets the girl! Add your review of "The Legend of Bold Riley" in comments! This sounds like an amazing graphic novel. But at which bookstores/online sites would you be able to buy this novel, other than the original publishers site? This GAP Ad makes me so happy!